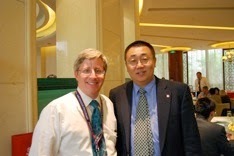 In May of 2011, I went with a delegation of about 30 financial planners to China for almost two weeks. The trip was coordinated with the Financial Planning Association and People to People. People to People was organized in 1956 by President Dwight Eisenhower with the idea that the best way to promote peace was to get individuals from different countries to meet. My trip took me to Beijing, Guilin, Shanghai, Xi’an, and Kunming over the 2-week period. We had local guides and met with financial planners from many different groups. It was interesting to learn what the financial planning industry is doing in China, as well as getting to see China’s progress first hand. We had the opportunity to meet with representatives of the Financial Planning Standards Board, the organization that supervises the Certified Financial Planner mark worldwide. China is one of their fastest growing countries and faces its own unique challenges. Financial planning is a very young concept in China, about four years old. Because the concept is so young, the CFP certificants are also young with an average age of 26. This is a big challenge, because many people don’t feel that a 26 year old has the knowledge or experience to do the best possible job (and I would probably agree). However, banks are hiring young financial planners as they are getting the job done. The Chinese people do not like disclosing too many details to their financial planner, and this can make the plan less effective. They tend to have assets and many different banks and might have similar types of investments because they have not shared this information with their advisors. Right now, a popular investment in China is real estate. They love to buy homes, and the value seems to double every 2-3 years. The US delegation cringed when we heard this and we gave them our own experience – real estate always goes up, until it doesn’t. The Chinese government has taken steps to lessen the chance of collapse in the real estate market by limiting families to owning a maximum of three homes and how they can buy them. They must put down a minimum of 30% on the first home, 60% for the second home, and the third home is purchased for all cash. While I don’t like the idea of restricting private property rights, I do believe that this should prevent or lessen the severity of a foreclosure crisis like we have here in Las Vegas. Banks will also pool investments from several individuals into a trust. They will buy different types of investments within the trust, such as commercial real estate, stocks and bonds. It wasn’t clear how these trust investments are regulated. The Chinese people were very hospitable and I was surprised at the number of English signs we saw. The airports were very easy to navigate and airport security seemed much more efficient than our own TSA. Many of the young people had iPhones and Android based phones. I was also surprised at the cars – they were the same ones we drive; VW, Toyota, Kia, Mercedes-Benz, and of course Buick. I often wondered why GM kept the Buick name around and now I know. The Chinese love Buicks and that is one big market. Beijing and Shanghai were very smoggy and reminded me of when I grew up in LA during the late 70’s. They have been relocating many industries away from the cities in an effort to clean up the air. I was also surprised to read in local English newspapers articles discussing major problems, such as acid rain affecting 50% of Chinese cities and about environmental disasters caused by the Three Gorges Dam. I’m sure that the papers don’t write about many things, but it was encouraging to see that not everything was censored. When I go to Europe, I try as hard as I can to blend in so I don’t stick out as a tourist. For some reason, it just didn’t seem worth the effort and boy did street vendors hit me up. It was lots of fun haggling over prices when shopping, but I’m not sure I would have the energy to do that every day, as the Chinese do. 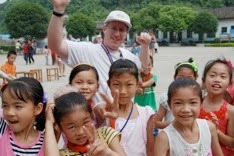 One of the highlights of the trip was visiting a rural school outside of Guilin. This school had a large building that was built by People to People and the kids were so excited to see us. They loved our digital cameras and how they could see themselves on the displays. Their classrooms consisted of wooden desks and blackboards while their playground equipment was two Ping-Pong tables and a few soccer balls. One subject the kids were learning in rural China was English. They entertained us with a few songs and read a few books to us. We did have opportunities to see many sights. The Great Wall was definitely impressive. It is hard to imagine building such a feat without big yellow construction equipment. Our visit to see the Terra Cotta Warriors was also exciting. I have to wonder how many other wonders are buried under the ground. I always say that it is important to learn from your mistakes, but cheaper to learn from the mistakes of others. The Chinese government is obviously aware of the many mistakes we have made during this country’s short lifetime and they are definitely taking steps to avoid some of them. Unfortunately many Chinese companies and local governments suffer from corruption, but I believe it will lessen as time goes on. When I heard that this trip was being planned, I was excited about the opportunity. With China becoming an economic powerhouse, I felt it was important to understand what is going on in that part of the world. While it is hard to get a complete understanding in just two weeks, I really feel that the trip was worth the time from the office and my family.